SAMUEL JEWKES, a MORMON SHOOTER AND CLUBBER, a private, Second Platoon, Company F of the Iron County Militia. 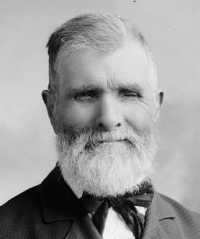 Jewkes was an engineer and left Iron County after the Mountain Meadows Massacre. Jewkes was indicted in the massacre in 1874 and he went into hiding. However, like Elliott Willden, there is no information as to why the private was singled out and indicted when so many others were not. Though the indictment was handed down, the charges were never followed-through. The above information obtained from "Jewkes Family History", Lee, Arrest warrant and Shirts.